The people were arrested on suspicion of unlawful assembly after authorities tried to disperse the rally on the streets east of downtown Sacramento, including clergy and a Sacramento Bee reporter. 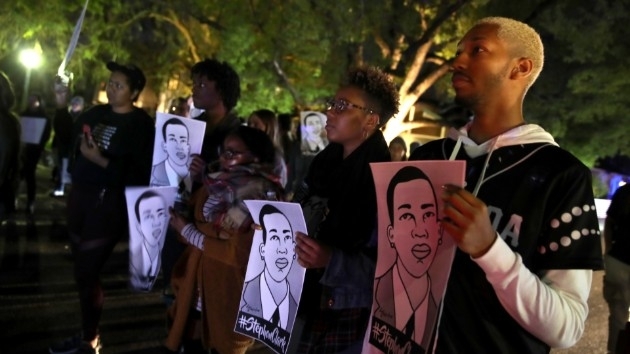 (SACRAMENTO, Calif.) — More than 80 people were arrested during a protest in California’s capital on Monday night in the wake of the district attorney’s decision to not charge the two police officers who shot and killed Stephon Clark last year, authorities said. The people were arrested on suspicion of unlawful assembly after authorities tried to disperse the rally on the streets east of downtown Sacramento, according to Capt. Norm Leong of the Sacramento Police Department. A number of cars were found keyed during the demonstration. Dale Kasler, a reporter for The Sacramento Bee, was among those arrested. He was covering the demonstration and had been filming a livestream at the time of his arrest. He was released late Monday after being detained for about an hour, the newspaper said. Sacramento Mayor Darrell Steinberg said he was “very disappointed” about Kasler’s arrest. Protesters took to the streets after Sacramento County District Attorney Anne Marie Schubert announced over the weekend that two officers — Terrence Mercadel and Jared Robinet — would not face charges related to the fatal shooting of Clark, a 22-year-old black man who was holding a cellphone when he was gunned down the night of March 18, 2018. One of the officers is black and the other is white. “No charges does not diminish the anger, the frustration we heard since the time of his death,” the district attorney added. The officers confronted Clark in Sacramento that night after receiving a 911 call about someone breaking into cars in the neighborhood. Surveillance video shows Clark smashing the windows of three vehicles, according to Schubert. The 911 caller informed police that the suspect had fled, jumping over a fence into a backyard. When the officers arrived on scene, they searched a nearby yard and found Clark staring into a sliding glass door where an elderly man was watching television, according to Schubert. Clark then smashed the glass with what Schubert described as a heavy object and fled into another yard, later determined to be his grandparents’ property. Bodycam footage released by police show the officers running after Clark and taking cover at the edge of a building. The officers yell several times for Clark to stop and show his hands before firing a barrage of gunshots. A toxicology report revealed that Clark had alcohol, prescription drugs and traces of marijuana and cocaine in his system at the time of his death, Schubert said. “Multiple shots to Stephon’s back tell a very different story than the cherry-picked facts presented today,” he added. Clark’s killing garnered nationwide attention and sparked mass protests in California’s capital and beyond. The Sacramento Kings professional basketball team honored Clark before their game against the Boston Celtics on March 25, 2018.